Casa José, Comares, Costa Del Sol. 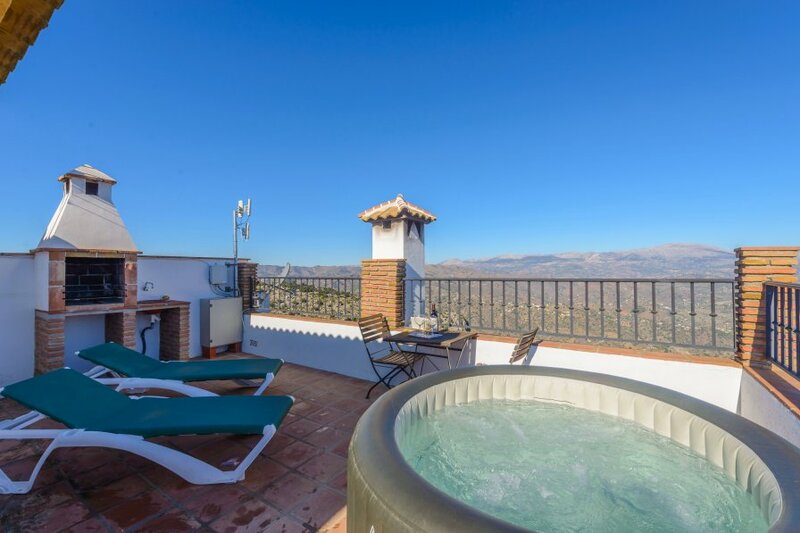 Lovely house in stunning village of Comares, air con, heating, wifi, village swimming pool, private jacuzzi, beaches 30 mins by car, visit Granada, Seville, Cordoba and Ronda. Very nice and spacious house in the lovely, historic village of Comares. The house sleeps up to 8 people and has entrance hall, living room/dining room with doors to balconies with amazing views, kitchen, 4 bedrooms, 2 bathrooms, balconies and finally, gorgeous roof terrace with breathtaking views. There is also the option of exclusive use of the private jacuzzi for an additional fee. The house also has heating, internet wifi, chimney and parking. The house is situated in the village and you can walk to bars, shops, restaurants, banks, chemist and bakery. The village has an excellent municipal swimming pool open July and August. You can reach gorgeous beaches in 30 minutes, by car, and Lake Vinuela is just 20 minutes. You can see the Lake from your terraces. Malaga centre is 1 hour and you can also visit Granada, Cordoba, Seville and Ronda in just a few hours. Come and discover Comares! Air conditioning in the bedrooms is an optional extra and is pay per use. The property is available for monthly let over the Winter months. The price is subject to electricity and wood/pellets. Comares is a picturesque 'blanco' village uniquely nestling 739 metres above sea level, with amazing views from the sea to sierras.The village is reachable within 1 hour from Malaga and 1hour 20 mins from Granada. Within the hour the amount of attractions available are numerous and diverse ranging from walks to go-carting , pony trekking to water parks ,beaches to historic cities , Spanish bars to English cinema , Air -conditioned shopping centres to cobbled street villages and golf courses to sandy beaches. Nerja with it's quaint beaches and famous caves is also only 1 hour away and you can be parked and skiing at Sierra Nevada within 2 hours. If you simply want to relax then the Andalucian countryside lends itself wonderfully to picnics, birdwatching , star gazing , painting and dramatic photography . Many people are amazed as to the flexibility of this region of Spain which allows such a 'varied vacation' to be easily achievable within its boundaries . Golf: The nearest golf course is approx a 40 minute drive away.The 18 hole Baveria Golf Course is between Velez Malaga and Torre Del Mar and membership is not required.Details on request.